"Here goes! GAOGUNDER! CIRCUS FORMATION!" He is the heir of the Daidenji Dojo. His mom is Sayaka and his dad is Genjirou. He's the leader of the Circus Battalion Gao Team and has a big knack of sarcasm in his mind. Sometimes he plays jokes to his teammates and to his little sister Shinobu. But always being foiled up when his big sister is around. Kinobu wants to be a famous baseball player when he grows up. 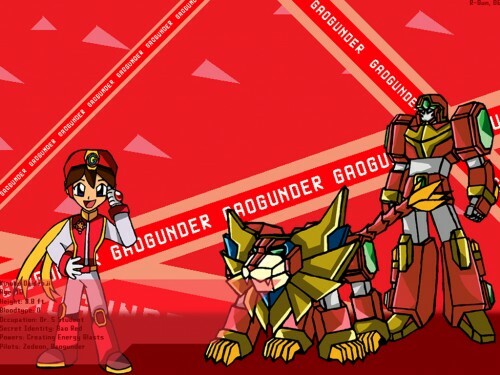 His special ability is to summon energy blasts, his secret identity is the Gao Red Fighter and he pilots the Zedeon the Red Lion which fuses with Falchion, Phampheon and Unicolion to form Gaogunder.